You can play any level right from the start. If you get stuck replaying a level over and over, without managing to pass it, I suggest you to take a break from it and start playing another level, you may have better luck with that one. Learn to spot the dropping surfaces, they have an distinct texture, learning how they look is a crucial point in Rolling Sky. You only have 20 lives, and you'll lose them quite fast, but they will recharge in an while. From my point of view this is a good thing, over playing any game will make it boring and frustrating. Take the free time to clear your mind and think of some improvements you can make in your gameplay. Learn the patters in each level, passing any level in Rolling Sky is next to impossible if you don't learn the movement patterns of the obstacles. Practice jumps timing. Jumping early or too late from one platform to another will result in failure. Take some time to master the right moment of the jumps. 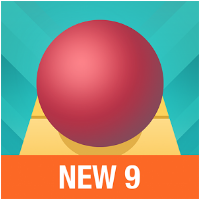 Rolling Sky Level 9 Walkthrough, Cheats, Solution for Android, iPhone, iPad, iPod. Note: This is "Rolling Sky" by "Cheetah Games"
Rolling Sky Level 8 Walkthrough, Cheats, Solution for Android, iPhone, iPad, iPod. Rolling Sky Level 7 Walkthrough, Cheats, Solution for Android, iPhone, iPad, iPod. Rolling Sky Level 6 Walkthrough, Cheats, Solution for Android, iPhone, iPad, iPod. Rolling Sky Level 5 Walkthrough, Cheats, Solution for Android, iPhone, iPad, iPod. Rolling Sky Level 4 Walkthrough, Cheats, Solution for Android, iPhone, iPad, iPod. Rolling Sky Level 3 Walkthrough, Cheats, Solution for Android, iPhone, iPad, iPod. Rolling Sky Level 2 Walkthrough, Cheats, Solution for Android, iPhone, iPad, iPod. Rolling Sky Level 1 Walkthrough, Cheats, Solution for Android, iPhone, iPad, iPod. Rolling Sky by Cheetah Games walkthrough all levels for android and iOS devices. Rolling Sky is an 3D fast peace action game that put's your reactions to the ultimate test. It only has 9 levels, for now, but all of them are really challenging to beat. The game mechanics are quite simple, only thing you need to do is slide your finger left and right to control the ball, keep it on the track and avoid the obstacles. Sounds simple, but is not! You'll need to learn each level and be prepared to fail a lot until you manage to beat it. I'm gonna share with you guys some basic tips and tricks to make your life easier and of course complete video walkthroughs for all 9 levels in Rolling Sky.